Ever stared at a second hand and think that time stands still for a moment? It’s not just you. Sometimes, when I look at a clock time seems to stand still. Maybe you’ve noticed this to your bemusement or horror as well. You’ll be in the middle of something, and flick your eyes up to an analogue clock on the wall to see what the time is. The second hand of the clock seems to hang in space, as if you’ve just caught the clock in a moment of laziness. After this pause, time seems to restart and the clock ticks on as normal. It gives us the disconcerting idea that even something as undeniable as time can be a bit less reliable than we think. This happened to me for years, but I never spoke about it. Secretly I thought it was either evidence of my special insight to reality, or final proof that I was a little unhinged (or both). But then I found out that it’s a normal experience. Psychologists even have a name for it – they call it the “stopped clock illusion”. Thanks psychologists, you really nailed that one. An ingenious experiment from a team at University College London recreated the experience in the lab and managed to connect the experience of the stopped clock to the action of the person experiencing it. They asked volunteers to look away and then suddenly shift their gaze to a digital counter. When the subjects tried to judge how long they had been looking at the digit that first appeared, they systematically assumed it had been on for longer than it had. Moving our eyes from one point to another is so quick and automatic that most of us probably don’t even think about what we are doing. But when you move your eyes rapidly there is a momentary break in visual experience. You can get a feel for this now by stretching your arms out and moving your eyes between your two index fingers. (If you are reading this in a public place, feel free to pretend you are having a good stretch.) As you flick your eyes from left to right you should be able to detect an almost imperceptibly brief “flash” of darkness as input from your eyes is cut off. It is this interruption in consciousness that leads to the illusion of the stopped clock. The theory is that our brains attempt to build a seamless story about the world from the ongoing input of our senses. Rapid eye movements create a break in information, which needs to be covered up. Always keen to hide its tracks, the brain fills in this gap with whatever comes after the break. Normally this subterfuge is undetectable, but if you happen to move your eyes to something that is moving with precise regularity – like a clock – you will spot this pause in the form of an extra long “second”. Fitting with this theory, the UCL team also showed that longer eye-movements lead to longer pauses in the stopped clock. It doesn’t have to be an eye movement that generates the stopped clock – all that appears to be important is that you shift your attention. (Although moving our eyes is the most obvious way we shift our attention, I’m guessing that the “inner eye” has gaps in processing in the same way our outer eyes do, and these are what cause the stopped clock illusion.) This accounts for a sister illusion we experience with our hearing – the so-called “dead phone illusion”, which is when you pick up an old-fashioned phone and catch an initial pause between the dial tone that seems to last longer than the others. These, and other illusions show that something as basic as the experience of time passing is constructed by our brains – and that this is based on what we experience and what seems the most likely explanation for those experiences, rather than some reliable internal signal. Like with everything else, what we experience is our brain’s best guess about the world. We don’t ever get to know time directly. In this sense we are all time travellers. I often get this where the second hand initially appears to move backwards, then carries on forwards. 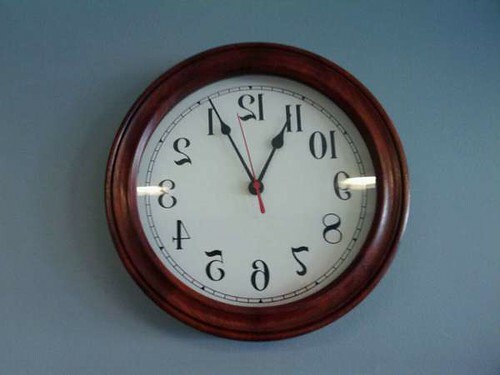 When this clock was recent on my wall, whenever I glimpsed at it, the seconds hand would move as my brain expected it! This fleeting illusion would stop for a brief pause and finally the seconds-hand starts it’s counterclockwise movement. *Barber Clock: placed on the wall behind the customer; he is facing the mirror; and so the reflected clock looks ‘right’. Great post about some interesting illusions. I have a few theoretical quibbles though: How does the brain perform this “filling in”? And what about this “inner eye”? It’s all well and good to use quotes or metaphors, but when we get down to the nitty-gritty, these kinds of issues won’t go away. It probably has to do with the way the brain is constantly anticipating and predicting the patterns of it’s inputs. We all know we have a blind spot in our eye that’s not easily perceivable, even with one eye closed. This is because the brain is constantly patching in areas of uncertainty using past experience. I guess that these illusions appear because the brain thinks the input will do something, when it does something completely different like in their “oddball” class of experiments. The time dilation probably comes from the unexpected patterns being “encoded” into memory. I can’t quite agree with the conclusion that time is only experienced through perception and that there is no internal signal. If there was no “internal clock”, then how could we judge that the first second on the clock was longer?